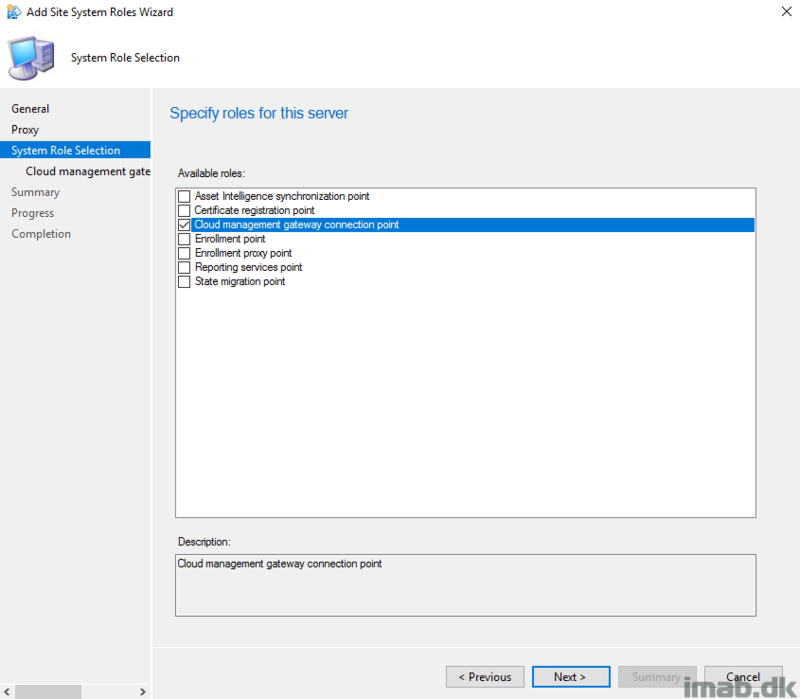 Most of the doing is happening from within the Configuration Manager console. 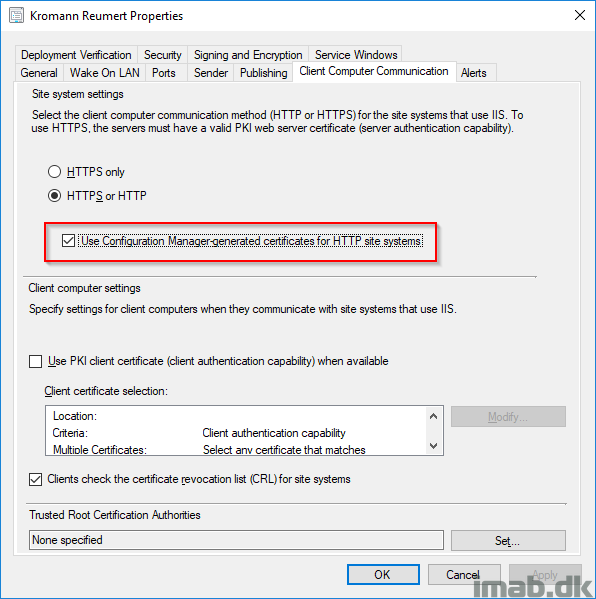 First step is to enable “Use Configuration Manager-generated certificates for HTTP site systems“. This is done in the Administration work space, Site Configuration, Sites and Properties of your primary site as illustrated below. As you also notice, this site is running HTTP without PKI certificates. ATTENTION: This requires the pre-release feature: “Enhance HTTP site system” to be turned on! 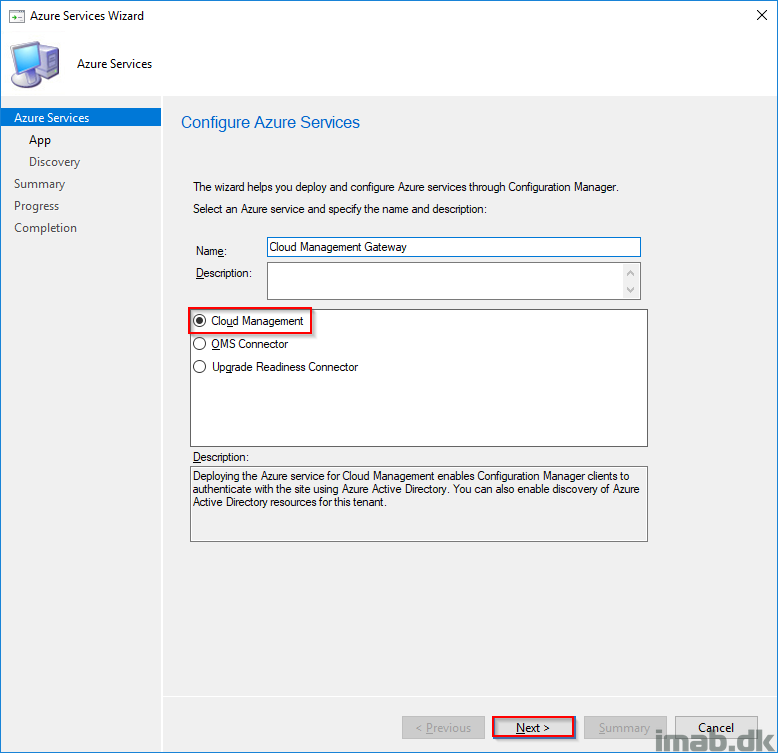 Next is to configure the relevant Azure Service also in the Configuration Manager console, Administration work space, Cloud Services -> Azure Services. Select Cloud Management and give it a suitable name. Create the two applications highlighted below. Note: If you already have the web app created, the wizard will prompt you to reuse the existing. 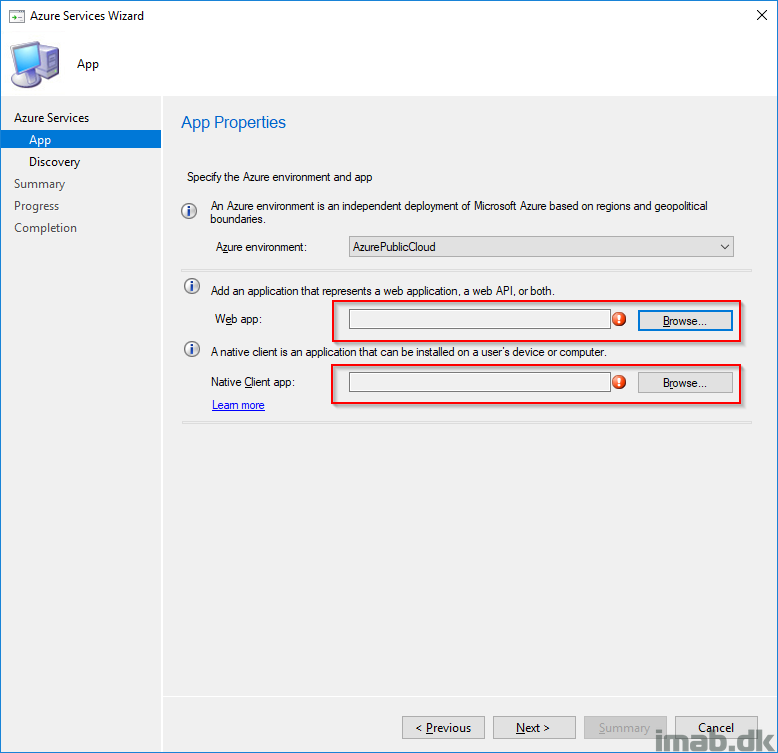 Chances are that you already have Microsoft Store for Business configured in Configuration Manager. If that is the case, you will have the web app already. The defaults for creating the apps can be used. Nothing but the names are required. Next up is adding the actual CMG. 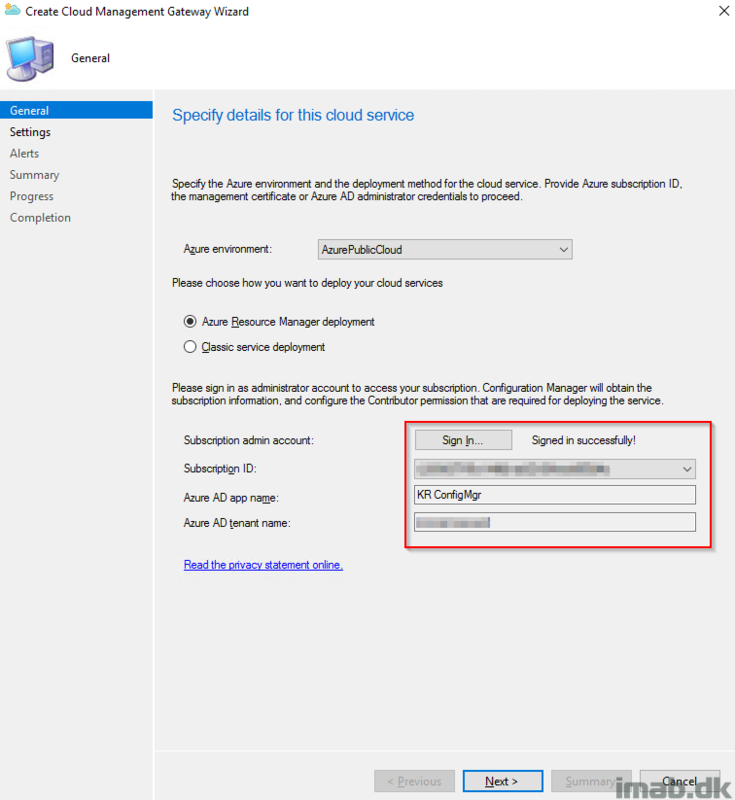 Here you need to sign in to Azure with an subscription administrator. 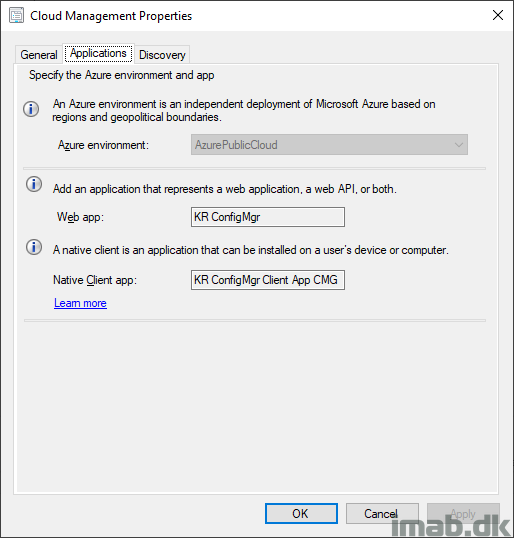 The selection here will be the Azure Resource Manager deployment. Next step is probably the most advanced step of them all (which in fact is quite simple). 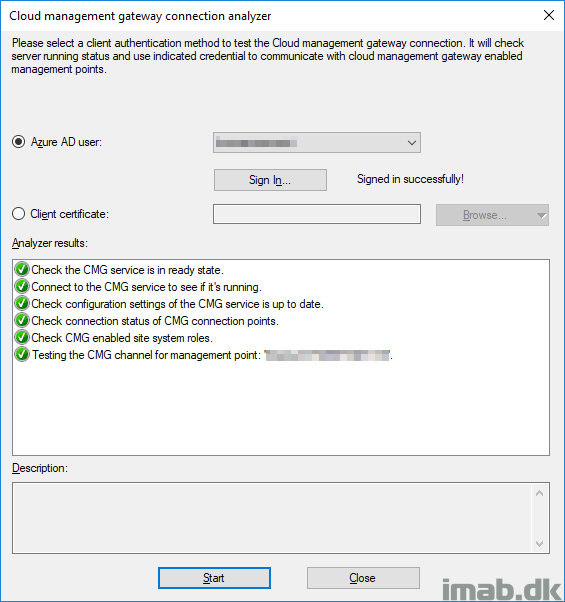 This is the part where you have to upload the one and only certificate used for configuring all of this, and decide for some of the settings for the CMG in Azure. Certificate file: This is the server authentication certificate, and in my scenario a certificate issued by a public provider like DigiCert, Thawte or VeriSign. 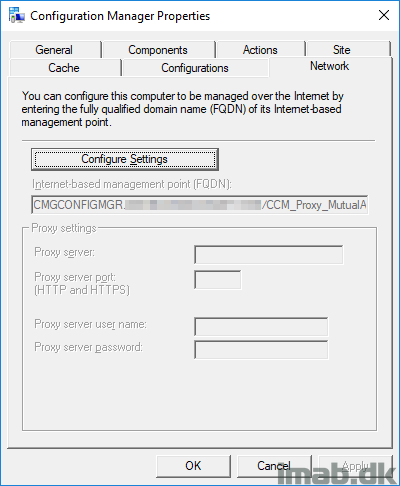 Service FQDN: In this scenario I have selected cmgconfigmgr.mydomain.com matching the domain in the certificate. This is a name that you decide for yourself and can be anything (almost). Service name: The service name will be populated once above is in place. 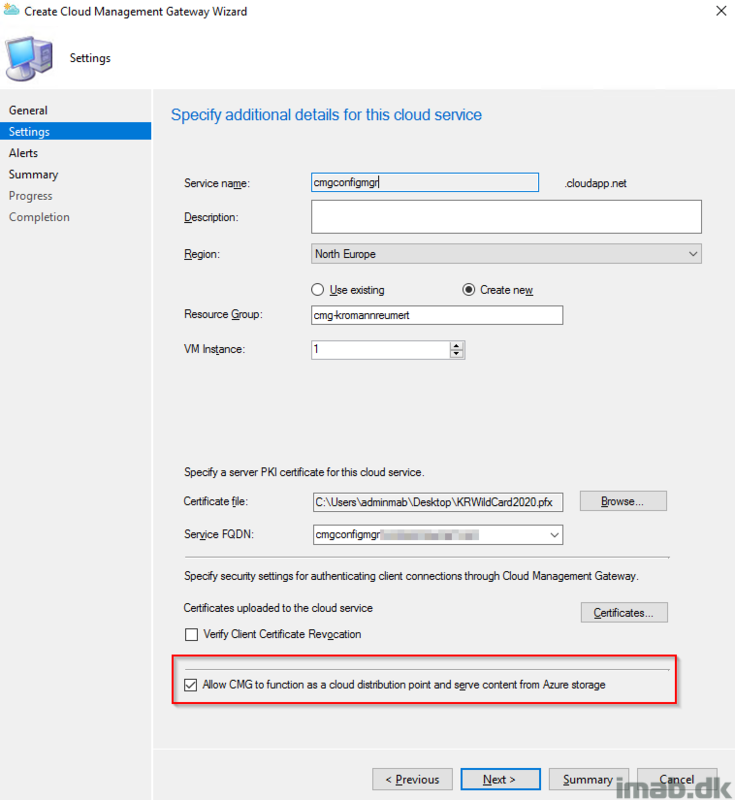 Note that the Service name has to be unique, as this will be a part of the cloudapp.net domain. Resource Group: I’m creating a new resource group in Azure. Allow CMG to function as a cloud distribution point: Yes please, you would want to have this, as this will save you the trouble and money for having a cloud DP separate from the CMG. For now, I just accepted the defaults on the Alerts page and finished the wizard. Before I moved on to the next steps, I made sure that the CMG had a status of Provisioning complete as shown below. It might take a few minutes to complete. Patience. The log files CloudMgr.log and CMGSetup.log on the site server is of interest to monitor during this phase of the setup. 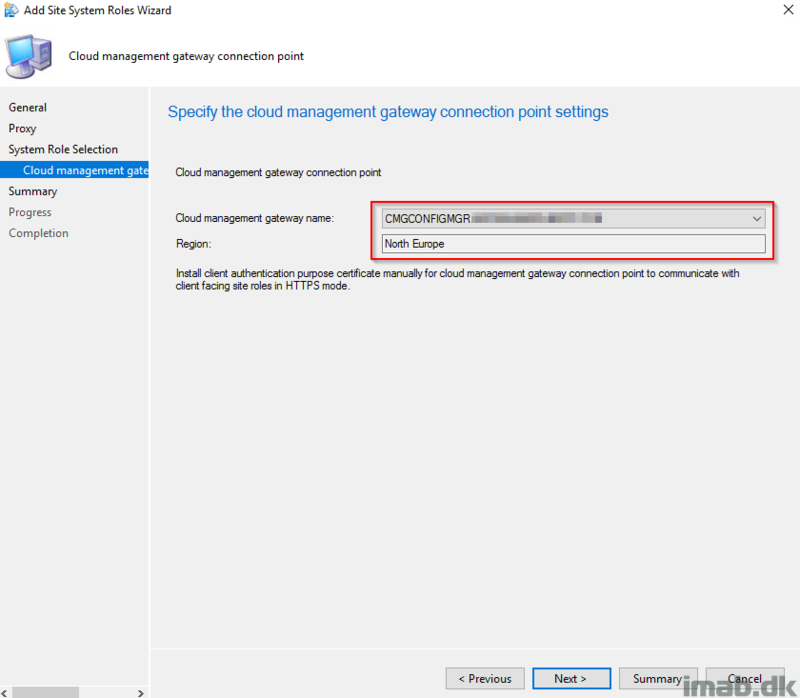 Add the Cloud Management Gateway Connection Point site system role. I have chosen to add this on my primary site server, but this can be any site server you like. 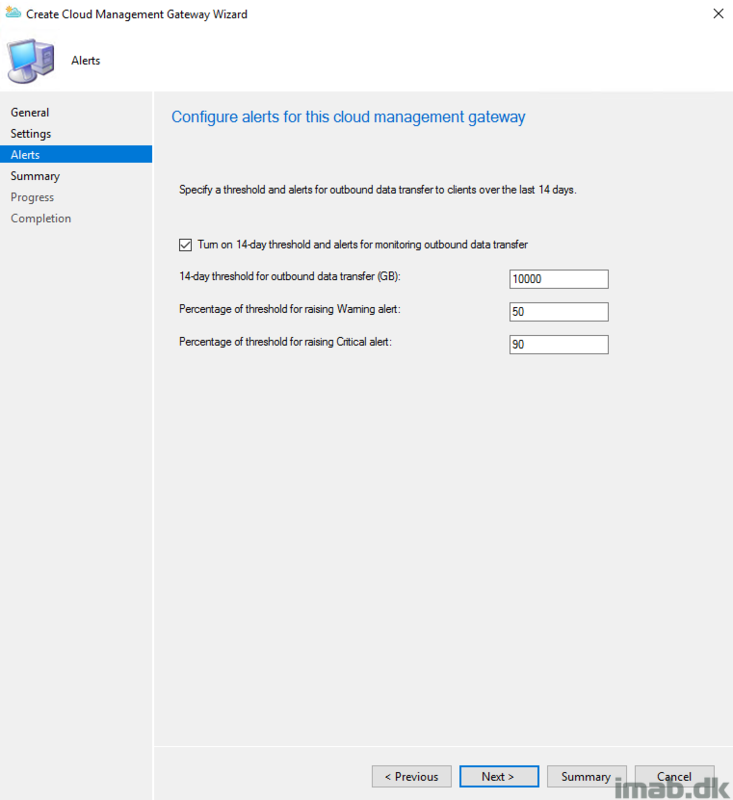 With everything else mentioned in this post completed, the cloud management gateway name will automatically be filled out as shown below. 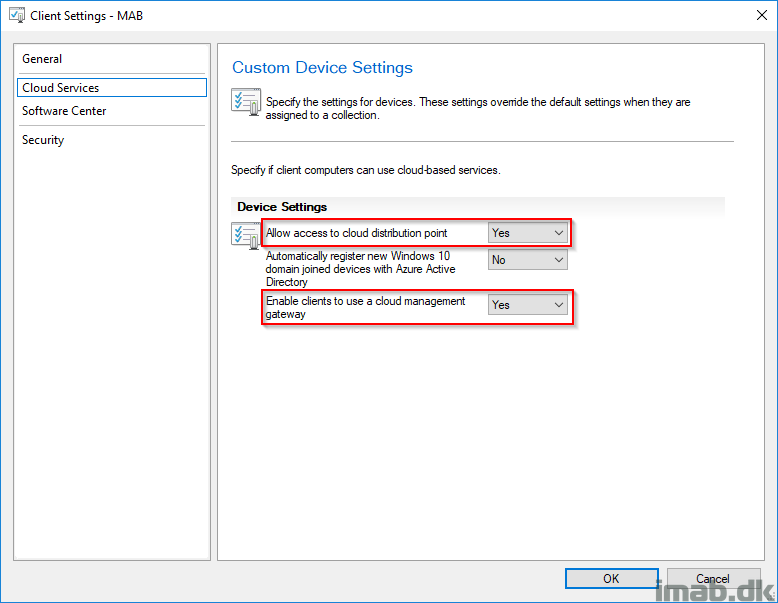 Next, make sure that your management point has following setting enabled, and thus allows the MP to have both intranet and Internet connections. Make sure to have these settings in your Client Settings set to Yes and the Client Settings deployed to your clients. All of this awesomeness requires that you create a CNAME in your organizations public DNS. 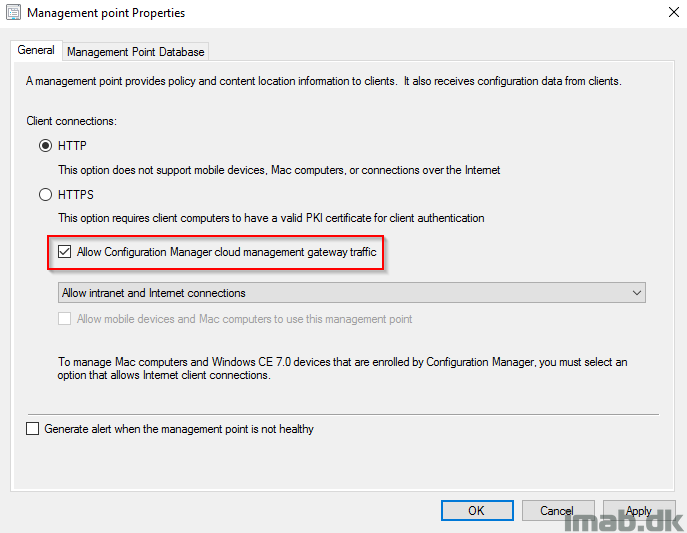 In this scenario, that will be cmgconfigmgr.mydomain.com pointing to cmgconfigmgr.cloudapp.net. Remember that this may take a while to replicate across the globe to all DNS servers. 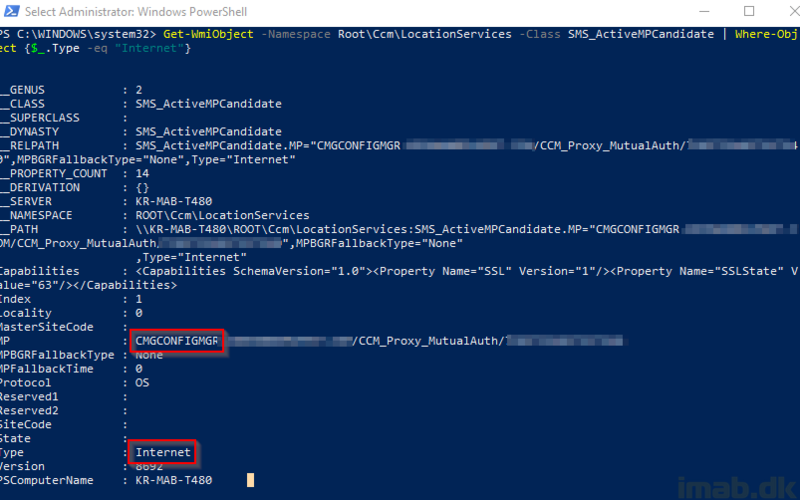 Note: If something in the DNS alias is not working properly, you will find similar entries to this in the SMS_CLOUD_PROXYCONNECTOR.log on the site server. 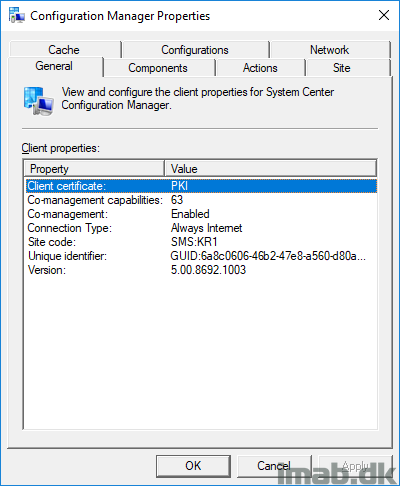 To get the “Use Configuration Manager-generated certificates for HTTP site systems“ setting to appear you must enable “Enhanced HTTP Site System” Pre-release Feature in 1806. But when we check on computer that is “Currently Internet” We still see in the Client Certificate: Self-Signed. Thankyou for the great guide Martin. Can you help me I am stuck at the very first part.. I do not have a tick box in that screen saying “Use Configuration Manager-generated certificates for HTTP site systems”. I am running 1806 so expected to see it. My screen looks exactly the same without the tick box option. Do you think I need to add the site system role “cloud management gateway connection point” in order to get this? Appologies i see someone else answered this.. please ignore me. Does this work with on prem domain joined clients? However if you try in the console to run a endpoint protection “full scan” or “quick scan” through the sccm console to the remote machine it seems to run but on the remote machine “Windows Defender Security Centre” console it still says the last scan was yesterday rather then today. Just wondered if this should work or not based on other people’s experiance? Primary stand alone site here with 40+ remote DPs.. I can’t see in your guide the below role being enabled, but should it be? Just confirming that the public cert would be a paid Standard SSL cert from somewhere like DigiCert?